Muji is responsible for the elegant, minimalist and relaxed design of Gacha, the bus whose eye-catching appearance recalls that of a capsule. The vehicle, which has neither front nor back, has a range of more than 100km; it can carry a total of 16 passengers and reach a top speed of 40km/h. The seats follow the rounded shape of the bus and are fitted with an LED light belt that both illuminates and transmits information for the passengers, in combination with the top panels of the vehicle which indicate the line and destination. Tested and validated in the conditions of Arctic Lapland, Sensible 4—the manufacturer company—has created systems capable of safely operating in unfavourable atmospheric conditions such as snow or intense rain. It also guarantees optimal navigation and obstacle detection performance regardless of the conditions and the surroundings. 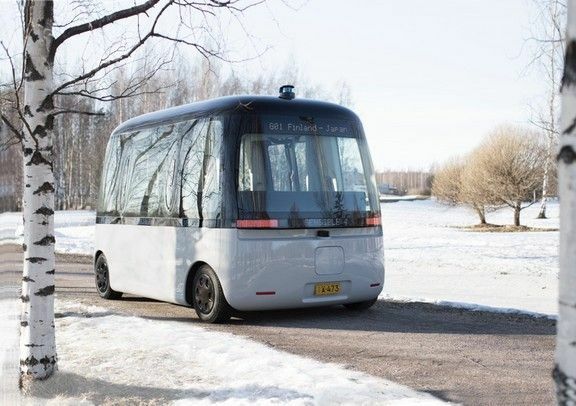 After its launch, this self-driving bus prototype has the goal of serving this year as public transport in Helsinki, and carry passengers in three more Finnish cities by 2021.